Like the LHC, Planck is a European experiment. It was launched back in 2009 on an Ariane 5 rocket along with the Herschel Space Observatory. The US through NASA also contributed though. 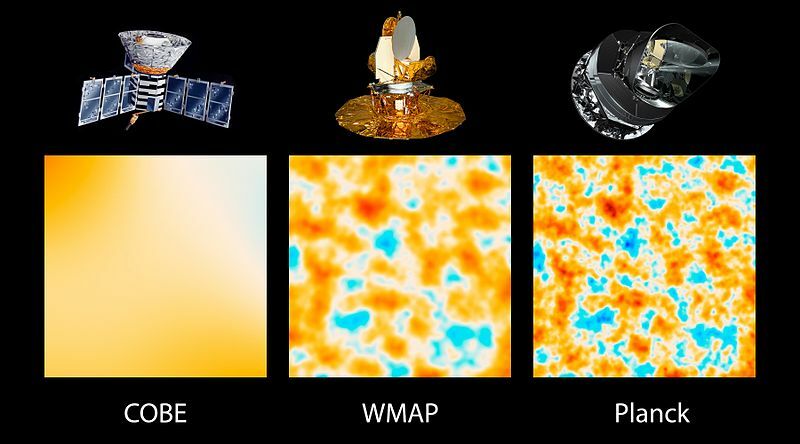 The Planck data has given us some new measurements of key cosmological parameters. The universe is made up of 69.2±1.0% dark energy, 25.8±0.4% dark matter, and 4.82±0.05% visible matter. The percentage of dark energy increases as the universe expands while the ratio of dark to visible matter stays constant, so these figures are valid only for the present. Contributions to the total energy of the universe also includes a small amount of electromagnetic radiation (including the CMB itself) and neutrinos. The proportion of these is small and decreases with time. Using the new Planck data the age of the universe is now 13.82 ± 0.05 billion years old. WMAP gave an answer of 13.77 ± 0.06 billion years. In the usual spirit of bloggers combinations we bravely assume no correlation of errors to get a combined figure of 13.80 ± 0.04 billion years, so we now know the age of the universe to within about 40 million years, less than the time since the dinosaurs died out. This is like a fourier analysis done on the surface of a sphere are it is believed that the spectrum comes from quantum fluctuations during the inflationary phase of the big bang. The points follow the predicted curve almost perfectly and certainly within the expected range of cosmic variance given by the grey bounds. A similar plot was produced before by WMAP but Planck has been able to extend it to higher frequencies because of its superior angular resolution. However, there are some anomalies at the low-frequency end that the analysis team have said are in the range of 2.5 to 3 sigma significance depending on the estimator used. In a particle physics experiment this would not be much but there is no look elsewhere effect to speak of here, any these are not statistical errors that will get better with more data. This is essentially the final result. Is it something to get excited about? To answer that it is important to understand a little of how the multipole analysis works. The first term in a multipole analysis is the monopole which is just the average value of the radiation. For the CMB this is determined by the temperature and is not shown in this plot. 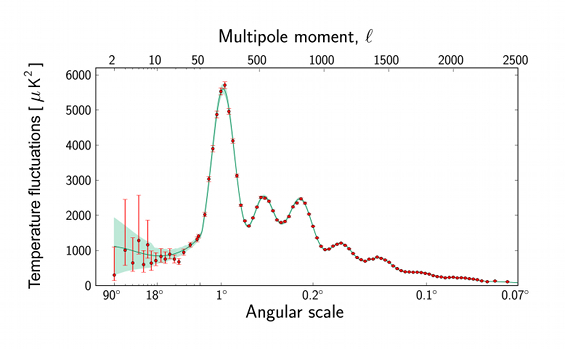 The next multipole is the dipole. This is determined by our motion relative to the local preferred reference frame of the CMB so it is specified by three numbers from the velocity vector. This motion is considered to be a local effect so it is also subtracted off the CMB analysis and not regarded as part of the anisotropy. The first component that does appear is the quadrupole and as can be seen from the first point on the plot. The quadrupole is determined by 5 numbers so it is shown as an everage and a standard deviation. As you can see it is significantly lower than expected. This was known to be the case already after WMAP but it is good to see it confirmed. This contributes to the 3 sigma anomaly but on its own it is more like a one sigma effect, so nothing too dramatic. In general there is a multipole for every whole number l starting with l=0 for the monpole, l=1 for the dipole, l=2 for the quadrupole. This number l is labelled along the x-axis of the plot. It does not stop there of course. We have an octupole for l=3, a hexadecapole for l=4, a dotriacontapole for l=5, a tetrahexacontapole for l=6, a octacosahectapole for l=7 etc. It goes up to l=2500 in this plot. Sadly I can’t write the name for that point. Each multipole is described by 2l+1 numbers. If you are familiar with spin you will recognise this as the number of components that describe a particle of spin l, it’s the same thing. If you look carefully at the low-l end of the plot you will notice that the even-numbered points are low while the odd-numbered ones are high. This is the case up to l=8. In fact above that point they start to merge a range of l values into each point on the graph so this effect could extend further for all I know. Looking back at the WMAP plot of the same thing it seems that they started merging the points from about l=3 so we never saw this before (but some people did bevause they wrote papers about it). It was hidden, yet it is highly significant and for the Planck data it is responsible for the 3 sigma effect. In fact if they used an estimator that looked at the difference between odd and even points the significance might be higher. There is another anomaly called the cold spot in the constellation of Eridanus. This is not on the axis of evil but it is terribly far off. 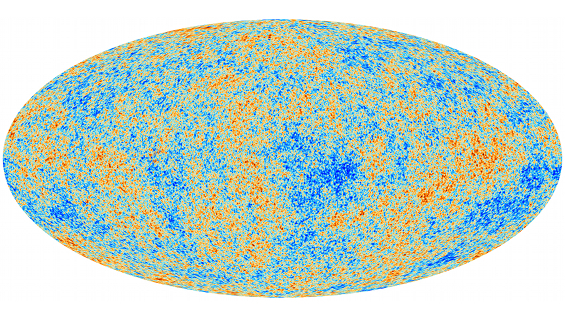 Planck has also verified this spot first seen in the WMAP survey which is 70 µK cooler than the average CMB temperature. What does it all mean? No idea! 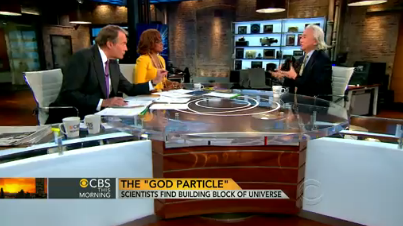 It would be amiss of me not to jump into the debate about what Michio Kaku said on CBS about the Higgs boson. If you don’t know what I am talking about see the blogs of Sean Carroll, Matt Strassler, Peter Woit, Lubos Motl etc. The initial case for the prosecution was that Kaku had said incorrectly that the Higgs Boson caused the big bang. If you listen more carefully to the details, he is saying that the Higgs boson could be part of a family of scalars that includes the inflaton responsible for inflation. This justifies that the Higgs boson put the bang into the big bang. It is perfectly true that this could be how it works and despite accusations to the contrary Kaku used the words “think” and “could” to indicate that this was a speculative hypothesis, not settled fact. If you missed those caveats it’s your fault not his. He rightly stresses that physicists dont like the term God particle used by the reporters but he is not making a great deal out of it. The term sticks because people remember it and it tells them that the Higgs boson is considered important. I think it has been explained enough times that it was a joke and was not intended to be taken literally. If the public still don’t get that then there is no hope for their understanding. Ina any case Kaku is not the one guilty of promoting the usage in this interview. Motl has covered this in the blog post and I agree with what he says. There is just one thing that I think is worth adding. Kaku says that the Higgs boson could be the trigger that sets the big bang off. This is the part that has led to so much criticism In the original inflation theory the era of rapid expansion does not start right away when the universe is created. If that is the case then it might be true to say that the Higgs boson puts the bang into the big bang but it would not be right to say that it triggered the big bang. So what is he referring to? The answer I think is a genre of big bang theory in which there is a time before the big bang when it was in a steady meta-stable state. According to these theories our universe was triggered by a transition to another vacuum in which the inflaton is responsible for its rapid growth right from the first instant of the new phase. The theory of eternal inflation is one sub-variety of this type of cosmological hypothesis. Personally I do not favour such theories because they seem to be inspired by a philosophical desire to explain the universe in terms of temporal causality and as I discussed at length in my most recent FQXi essay, that is not my philosophy. Nevertheless it has become a popular class of theory with cosmologists. Ironically Sean Carroll who sparked off this attack on Kaku seems to be one of its biggest supporters. Matt Strassler criticises Kaku above all for not making it clear which parts of what he was saying were speculative. I invite you to listen to what he said again (see the links to the video on the other blogs). He actually stresses very clearly that “we do not know how or why” the big bang started, but “we think” the Higgs boson may be a key piece of the answer. I don’t think he could have made it any clearer that these are just possibilities. If you are concerned that Kaku seems to think that the Higgs boson is responsible for inflation then be aware that this might actually be the case. Sean Carroll denies that this can be the case and Matt Strassler says that it is unlikely. Motl explains exactly why it could be the case and I remember hearing about this in a webcast talk at Moriond on the same day as some of the new results were being aired. The theory requires an extra coupling between the Higgs boson and the curvature tensor and it has its problems, but then so does every other theory of inflation. The model does at least have the virtue of not requiring other unknown fields. When Strassler says that this version of inflation is “unlikely” he is expressing his own opinion. He claims in a comment that he does not express his own personal opinion without indicating as much, yet here he does exactly that. Kaku is an eloquent speaker and he knows his subject. He is very careful with his words and knows the kind of angle on a physics story that will get the general public interested. Most people do not have the time to digest the kind of details that are explained at length on some of the blogs, yet Kaku can convey a feeling of our excitement that ordinary people can appreciate immediately. Yes, the basic known facts about the Higgs boson are interesting and exciting too but the more speculative ideas that people are working on are what really gets people to sit up and listen. If some physicists fear that people cannot distinguish between known and unknown facts when words like “could” and “think” are used then they are simply not giving people enough credit. Science reporting needs to cover the full range of news from the latest experimental results to the wildest new theories being discussed by physicists. If it does not do so then it will not inspire new young scientists to take up research. People like Kaku may not please everyone but they are getting the message across. I am sure he will not be discouraged by boring physicists who simply don’t get it. CERN have a new press release out today while latest results are being presented at the QCD part of the Moriond conference. 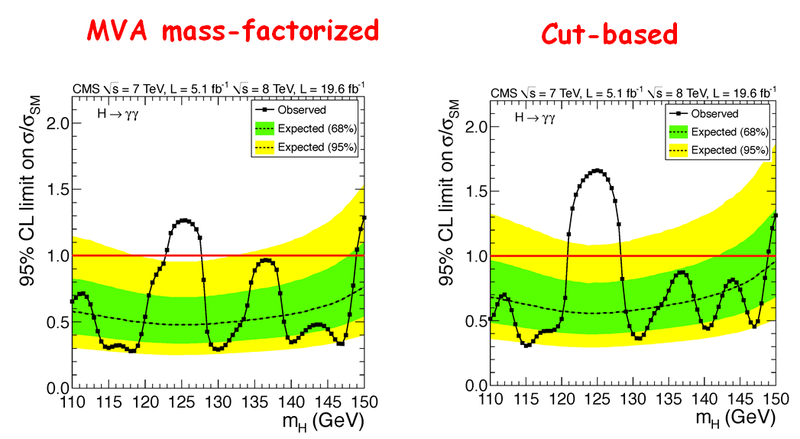 There are further updates since last week including the long awaited CMS results for the diphoton decay channel. The diphoton rate relative to standard model is now 0.8 +- 0.3, much lower than before and a huge disappointment for hopes of beyond-standard-model physics. “The beautiful new results represent a huge effort by many dedicated people. They point to the new particle having the spin-parity of a Higgs boson as in the Standard Model. 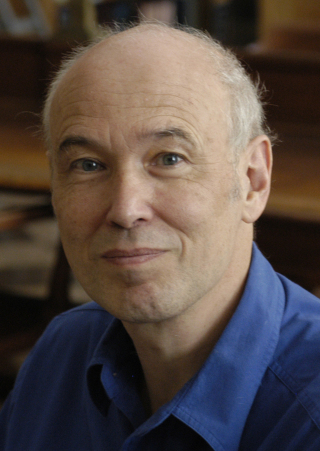 We are now well started on the measurement programme in the Higgs sector,” said ATLAS spokesperson Dave Charlton. It’s a bit meally mouthed but nevertheless, most c0mmentators are interpreting this to mean that they have agreed that it is a Higgs boson of some sort. The crux was the spin measurements which both teams agree disfavours spin 2 with positive parity at a 2 to 3 sigma level. The real Higgs boson has spin zero with positive parity and all other spin possibilities are directly ruled out by the fact that it decays to two spin-one photons. Negative spin zero is not quite so strongly ruled out but this is not being billed as such an important observation. Can it be determined with LHC run 1 data? Does CERN think it is deterministic for a Higgs boson? In summary, the things that CERN has decided are crucial for determining that this is a Higgs boson are thankfully exactly the things that can be determined from run 1 but there are plenty of other observations to keep them busy for run 2 and beyond. Todays LHCC meeting is currently being webcast and slides are going online here. Colin Bernet presenting the CMS update has confirmed that the crucial diphoton results have now been approved. He said they will be presented at Moriond today but the schedule suggests that it will be tomorrow. This part of the Moriond meeting is not being webcast so we will have to wait for slides to come online for the results. ATLAS have provided some animated gifs showing the accumulation of Higgs events over time in the diphoton and four-lepton channels. Enjoy. These dont seem to work in situ on the blog. You need to click on the images to get them to work. At what date do the Higgs bumps start to look real? You are currently browsing the viXra log blog archives for March, 2013.